Phil Torrone (whom if I'm not mistaken was previously at Engadget.com, now over at Orielly's Make Magazine) has posted a sweet video clip demonstrating a payphone he's converted into a working Skype phone. The true gadget geeks will love this. All I can say is, "I want one". 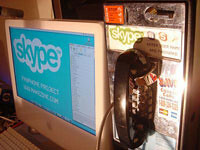 Here's a quick video I shot late last night of the Skype payphone actually working. It rings and can be used as a Skype phone for any call, SkypeIn/SkypeOut and it's just really really cool to have a working VOIP Skype payphone in one's living room. Next up getting it to take quarters so you can make calls and using the keypad as username and password entry. Thats so hot!!! I saved myself one of those old payphones also. Rotary dial one haha.I havent figured out how to hook it up to my home line and make calls yet. Almost makes me think of Dr. Who and the old english police call box and the space ship time machine. Great post as for me. I'd like to read more concerning that topic. The only thing it would also be great to see here is a photo of some jammer.